St. Jude Medical, Inc. (NYSE:STJ), a global medical device company, today announced the long-term data from RESPECT, a landmark trial, during a First Report session at the 2016 Transcatheter Cardiovascular Therapeutics conference in Washington, D.C. RESPECT, a clinical trial of nearly 1,000 patients diagnosed with patent foramen ovale (PFO), which is a small opening between the upper chambers of the heart, and cryptogenic stroke (stroke from an unknown cause), compared PFO closure to medical therapy alone. Final results demonstrated that after long-term follow-up (average of ~6 years), treatment with the St. Jude Medical AMPLATZER™ PFO Occluder was more effective than medical therapy alone in reducing the risk for recurrent ischemic stroke by 45 percent. "The final analysis revealed that PFO closure is an effective treatment option for young and middle-aged patients with PFO and stroke from an unknown cause who face lifelong risk for another stroke," said neurologist Dr. David E. Thaler of Tufts Medical Center in Boston and a RESPECT principal investigator. "RESPECT data also show that PFO closure with the AMPLATZER PFO Occluder is safe and has a low risk of device or procedure-related complications. The device was more effective than medication alone in preventing another stroke." The AMPLATZER PFO Occluder is designed to lower the risk of stroke by sealing off the hole between the left and right atria - the patent foramen ovale. Normally the foramen ovale, which is a small opening between the left and right atria, closes shortly after birth, but remains patent - or open - in approximately 25 percent of adults. Left untreated, a PFO could allow dangerous clots from the veins to pass from the right side of the heart to the left and travel up to the brain and potentially cause a stroke. "The AMPLATZER PFO Occluder procedure is minimally invasive; it is performed without an incision while the patient is sedated but still conscious," said Dr. John D. Carroll, director of interventional cardiology at the Cardiac and Vascular Center at the University of Colorado Hospital. "Interventional cardiologists and neurologists in major North American medical centers have worked together for more than 13 years to determine if PFO closure substantially reduces the risk of recurrent stroke; the data show it does." "The RESPECT trial generated more than 5,800 patient years of data and on average six years of patient follow-up," said Dr. Mark Carlson, chief medical officer and vice president of medical affairs at St. Jude Medical. "These final long-term results are key, showing the treatment to be effective in preventing another stroke in PFO patients who are otherwise healthy." These final analyses presented at TCT 2016, which include additional follow-up beyond those on which FDA approval was based, support continued patient benefit over an average of approximately six years of follow-up. 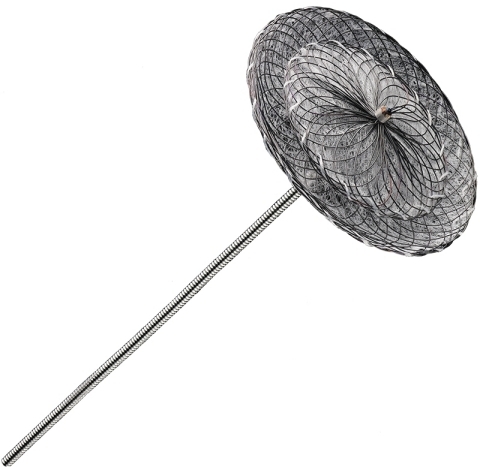 The AMPLATZER PFO Occluder was recently approved by the Food and Drug Administration and is the only device approved in the United States for PFO closure to reduce the risk of recurrent ischemic stroke in patients, predominantly between the ages of 18 and 60 years, who have had a cryptogenic stroke due to a presumed paradoxical embolism, as determined by a neurologist and cardiologist following an evaluation to exclude known causes of ischemic stroke.